Utilizing its more than 35 year experience presenting New York City’s longest running public dance festival, the Battery Dance Festival, Battery Dance consults and advises international arts organizations and presenters on developing their own dance Festivals. Having presented over 225 dance companies, the Company also provides key linkages to high-quality dance companies and to government officials responsible for programming those companies. Battery Dance’s Festival Development Consultancy is multi-tiered and includes an initial assessment of the viability and need for a festival, followed by building the knowledge and technical capacity of local hosts. This may include board development, strengthening organizational processes and procedures, technical planning and oversight, festival logistics, partnership and sponsorship development, and international dance company participation. 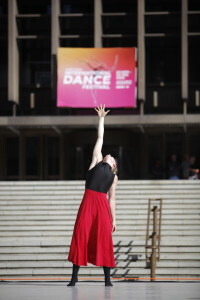 In 2012, Battery Dance conducted a multi-city tour of South Africa, sponsored by the U.S. Department of State, U.S. Embassy Pretoria, Africa Regional Services, and The Robert Sterling Clark Foundation. From this tour, an idea was borne to develop South Africa’s 1st international dance festival. The collaboration resulted in the 1st Cape Town International Dance Festival – Town + Township. The Festival included over a dozen participating companies from five countries performing on three stages – The Artscape Opera House, Artscape Plaza, and an outdoor stage in Gugulethu Township, over the course of 1 week from November 23 – December 6, 2015. The Festival brought the many communities of Cape Town together through both indoor and outdoor performance in different parts of the city. Supplemental activities included dance workshops and classes, dance film screenings, lectures, and networking events.